We understand that after starting life at Queenscliff “Jessie” spent most of her working life operating out of Portland. She was owned by a number of commercial fishermen that we have yet to trace before being used as a recreational fishing boat with motor only in later years. After being damaged in a storm in 1992, which caused the stem to be torn out and the boat to sink. 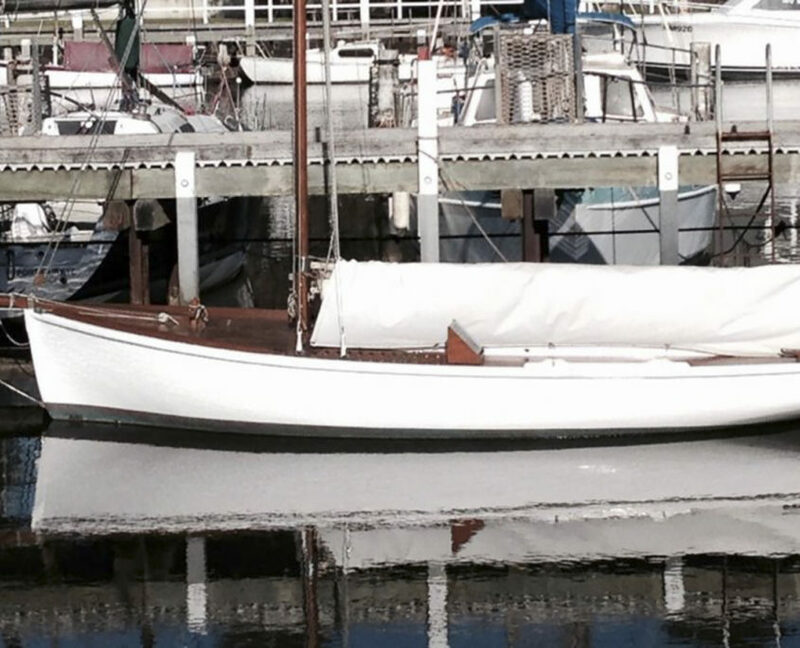 Garry Stewart, Boat Builder of Port Fairy, purchased the hull and worked on it at intervals between other jobs over the next five years. The restoration was finally completed in July 1997. The work involved fitting a new stem, some new ribs, sister ribs, a new Kauri deck from 80 year old timbers taken from the old Ballarat Brewery building in Ballarat, fitting a new centre case where the old motor had been and installing the new motor further aft. A new Oregan mast and gaff was made and the old mast converted to the boom. Garry Stewart is a real craftsman who did an excellent job on the restoration. 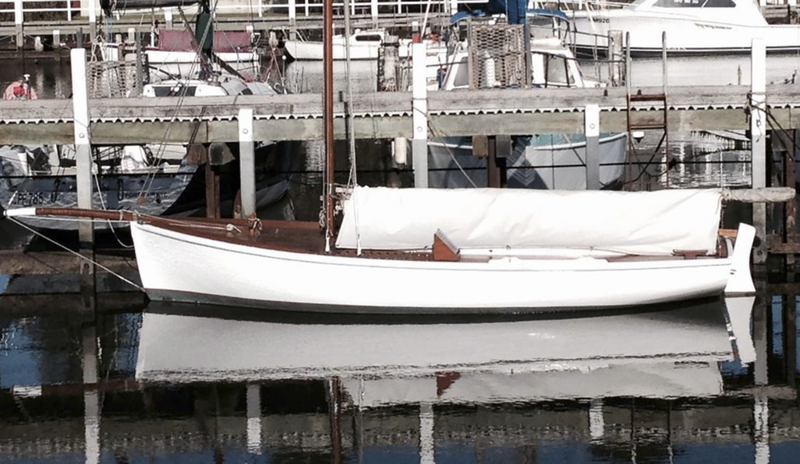 Jessie is a pretty little boat that gives Jock and I and our families a great deal of pleasure. Harry always claimed that his legs never worked as well once he stepped off his boat for the last time. Retired Queenscliff fisherman Harry Mouchemore died from a stroke. He gave up his craft about twelve years ago and was one of the last two of his breed living in the pretty coastal town of Queenscliff, Victoria, Australia. Once up to 50 Couta boats would head off in the dark from Queenscliff in search of the barracouta. Many fishermen lived in the rows of tiny harbourside cottages known as the Fisherman’s Flat. Harry was just 18 years old when he brought Jessie, his first Couta boat which he named after his first girl friend. He used to call all his boats after women. “I had six boats and so ran out of women” the happily married great-grandfather used to say with a laugh. His last boat, Pepe, got her name from his pet Chihuahua. Harry was born into a fishing family and grew up on Fisherman’s Flat, where his father was born. Harry’s cottage is so close to the water, he could watch the boats from his back porch. It is immediately adjacent to the Queenscliff Slipway and Harry could keep an eye on the boats being maintained on that. Despite the dust and noise he was sad to hear that the Slipway was to be decommissioned and removed as part of the new Queenscliff Harbour development, but due to his passing he does not have to watch it being dismantled. Harry had a few close calls on the water, once almost colliding with a steamer. He knew the coast like the back of his hand and used to count the pine trees on the foreshore for landmarks. Back then, there were no unions and quotas, and no such thing as GPS. When he moved into Cray fishing, Harry dangled a lead smeared with grease overboard to check if the bottom was sandy or rock. Because of his knowledge of tides and currents he was asked to be involved in the search for Prime Minister Harold Holt, who had disappeared while swimming at Portsea’s Cheviot Beach on 17 December 1967. A Memorial Service was conducted at the Queenscliffe Maritime Museum by his friend Lew Ferrier, the now last couta fisherman in the Flats. Next to the photo of Harry and a small bouquet of flowers was one of the Cray pots he used to make at the Museum, and his white line-honours jumper which was a present from the Queenscliff Couta Boat Association for his participation in Fishy Tales during the 2006 Queenscliff Maritime Weekend. He was a very accomplished sailor, and won many races. I remember him telling at Fishy Tales that he “lost a few – in fact there were 3!” and I reckon he could have probably told as the dates as well…. 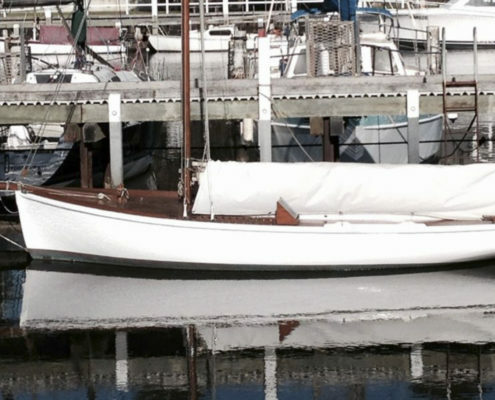 We would greatly appreciate any further information anyone may have about previous owners/activities of this boat, either from when it was built or subsequently.